Monitor, analyze, and manage a network. LanHelper 1.74 is other software developed by Hainsoft.com. LanHelper scans network at high speed and retrieves the abundance of network information. You can boot (Wake-On-LAN), shut down or lock your PCs, manage service, make the remote computers run commands. Remotely capture screen or kill processes at a regular intervals. 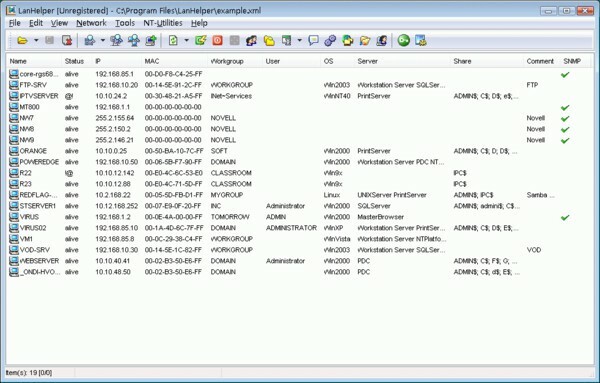 Detect on-line and off-line computers, and find the changed IPs or computer names. Monitor servers' availability in LAN/WAN. No server program needed. This other software is shareware, which means you can download and use LanHelper 1.74 for free during the trial period (usually for 30 days). At the expiration of the period you will have to buy the other product for $49.95. LanHelper 1.74 is available at regnow and Hainsoft.com website. LanHelper 1.74 supports different languages (including English, German). It works with Windows XP/Vista. We have tested LanHelper 1.74 for spyware and adware modules. The software is absolutely safe to install. We has completely tested other software LanHelper 1.74 many times, written and published the interesting article and uploaded installation file (1197K) to our fast server. Downloading LanHelper 1.74 will take minute if you use fast ADSL connection. 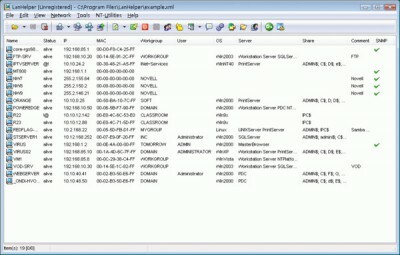 Remote Management and control of computers on a network. Shutdown, logoff, etc. Monitoring and diagnostic tool for network computers performance optimization.